This is the 2008 harvest of ice wine, a dessert wine that Eaker considers nectar of the gods. “There is no way to describe the beauty, elegance and special nature of ice wine,” Eaker says, insisting that appreciation can only be conveyed through taste. Vintners make ice wine from healthy grapes left on vines to freeze. The grapes are pressed when still frozen, and the highly concentrated juice becomes a distinctive, aromatic dessert wine after a long fermentation. Walters emailed me several days before today’s brittle-cold harvest, predicting that today would be the day for the picking. If I wanted to experience the moment, I needed to quickly rearrange my schedule and drive four hours north to Leelanau Peninsula. Full-time winemaker and part-time weather forecaster, Walters is one of Northern Michigan’s premiere vintners. Walters was winemaker at one of Michigan’s largest wineries, Leelanau Wine Cellars, for several years before taking the helm as winemaker at 45 North, in Lake Leelanau. He also owns One World Winery Consulting and makes wine for nearly a dozen wineries. As consulting winemaker for Longview Winery, Walters raked in 22 medals in Longview’s first year of operation alone. He boasts hundreds of medals for wines he has crafted, yet he’s still a few years shy of 40. Read the rest at MyNorth.com. 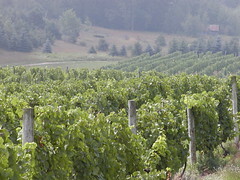 Matthies has deep roots in northern Michigan wine. He’s the son of Dan Matthies, owner of Chateau Fontaine in Lake Leelanau, who’s among the pioneers of Leelanau vintners and vineyard sales and development. Doug worked in vineyard management for 20 years, including a stint as vineyard manager for Leelanau Wine Cellars, among Michigan’s top wine producers. He’s also run his own Big Paw Vineyard Services for the past decade, planting vineyards, building trellises and pruning and maintaining area grape-growing properties. Matthies combines his experience in vineyard management with Shawn Walters’ knowledge. Walters is a former wine maker for Leelanau Wine Cellars who owns One World Winery, a consulting firm that works with a handful of area wineries. The two offer suggestions and advice based on the fruit that other wine makers bring in and the type of product they want. You can see some footage from inside in this video. Here’s a a pair of interviews with Shawn by Master Sommelier Claudia Tyagi, retired engineer and avid wine aficionado David Rusnell of michwine.com, and Kim Adams and George Heritier of Gang of Pour. You can read all about their tour of the Leelanau Peninsula and tastings at Gang of Pour.